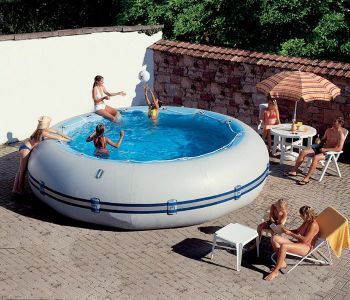 The 5m x 1.05m Deep Zodiac Winky Original Above Ground Swimming Pool is one of a kind due to offering just the right balance between various air and water pressures. We are delighted to have been appointed as a main distributor for the Azteck and Original pools from Zodiac in 2008. Zodiac Original above ground pools rely on a balanced technology of various pressures between water and air. The hold of the pool is guaranteed by the pressures that are applied by the confined air and water in the flexible walls, which arches under these pressures. Zodiac developed the Dyalon material which is made up of a dense polyester textile base placed between a double internal and external coating, the double wire reinforcement of which pushes back the limits of the tear strength, and resistance to abrasion and varying climate. Resulting from aeronautical techniques, thermobonding is a robotised industrial heat assembly process for flexible composite materials. This process is a guarantee of constant quality of the assembly and sturdiness. Thermobonding is used for assembly of the fabric panels of Zodiac Original Pools. The tube ring of a Zodiac Original Pool, thanks to its unique water circulation system, acts as a heat exchanger. The sun heats up the tube ring, the air confined within the tube increases in temperature and heats up the water contained in the tube. This heated water is then returned into the pool. Hence a much faster and on average more significant increase in water temperature, up to 2.5 degrees C is gained in Zodiac Original Pools compared to any other above ground pool on the market. PLEASE NOTE: The pump and filter need to be located 3.5 metres away from the pool and must be connected to a suitable weatherproof RCD-protected socket outlet. We recommend that filtration is turned OFF when the pool is in operation. We recommend a smooth concrete slab as a suitable base- contact a reputable local builder for advice on local soil conditions. BT, Northern Ireland - Phone us for quote. Isle of Wight - Phone us for quote.